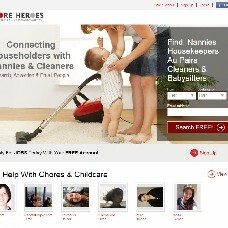 Chore Heroes connects households with housekeepers, cleaners, nannies and people willing to help with housework and childcare duties. Households liaise directly with potential helpers and avoid agency commissions. The site helps to find people to assist with the house and garden, cook, clean up, tidy, do the laundry, housework, run errands and babysit. Helpers can work full-time, part-time or on a casual or occasional basis.